Very attractive prices, ask !!! The 40sqm apartment is very quiet, recently renovated, overlooking the inner courtyard of the palace, is bright and faces south and enjoys light and sun all day. Decorated in an essential way, nice and functional to accommodate up to 4 people (couple with 2 children) or 3 friends, a couple or single. Inside is everything you need for a pleasant stay in Berlin: bed linen, baths, everything that can 'serve in the kitchen including microwave, television and the Internet if necessary. Composed of entrance, a small dressing room, bathroom with shower, in the most 'wide double bed, two armchairs, nice bed, then the living area with kitchen essential, all lit by two large double glazed windows to let in light and air at will '. The apartment has been completely renovated with parquet flooring installation of light wood, to make it more' warm and bright, is located on the second floor (no lift) of a building from the early '900, in the north the district of Neukölln (kiez Schillerpromenade). The apartment is close (only one metro stop) to the neighborhood recently renamed Kreuzkölln because the border of Kreuzberg. This is an area full of nightclub..
2. deposit € 200 * through the site. The deposit will be retained in the event of lost keys. * May vary due to holidays or anniversaries. 4. The maximum number of persons staying in the property must not exceed the number stated in the original reservation request (subject to change). 5. It is advisable to take out comprehensive travel insurance and personal for each member of the group, which includes cover for cancellation, medical cover and all personal belongings. In particular, it is recommended to / the Guest / s to sign a bill that includes liability insurance and to cover any damage to the apartment caused by a member of the group. This type of coverage is standard in all insurance policies on real estate. The owner's insurance does not take effect under these circumstances and / the 'Guest / s' are personally responsible for any damage caused by them or by other members of the group, to themselves or others. 6. In the apartment there is NOT a security safe, therefore we can not take any responsibility for any damage or theft of your property. If you deposit money or jewelry or anything of value in the apartment we do not assume any responsibility. 7. If you book a time to check in or out please respect it. If you are late, you calculate a surcharge of € 5 per half-hour wait, the premium is to be paid at check-in. A very flexible timetable is agreed to come and meet as much as possible, but if that should happen lasts an excessive delay and I waited in the apartment if you accumulate too late and there is the possibility of waiting further that in the apartment, due to another appointment or unavoidable commitments, check-in will be automatically postponed to time be determined by telephone, it will be done as soon as possible. And 'possible to check-in & out without charges 08: 00-20: 00. 8. The maximum number of days to reside in the property must not exceed that number, as originally stated in the request for the original booking (unless amended and agreed at a later date). 9. Guests are expected to behave in a civil manner, avoiding loud noises, and the unruly behavior that may disturb other neighbors. It is necessary that the owner or his representative, without delay, any defects in the property, any fault in the equipment, machinery or equipment. Provisions for repair or replacement must be made as soon as possible. 10. Smoking is strictly prohibited in all areas of the apartment. If you smoke, you will be responsible for a thorough cleaning including upholstery and soft furnishings. This amount will be deducted from the deposit. 11. When you go out of the apartment Always remember to check that the windows have been closed, including the bathroom and the kitchen, and that the heating is turned off. 12. The use of open flames, such as candles, incense, or the like. 13. Always close the heating before exiting. 14. Check that the sink and shower are closed. 15. When you exit from the always close the door of the apartment with the key. • temporary absence or suspension of the supply of public utilities to the property or equipment, plant, machinery or appliances supplied to the apartment. • loss, damage or injury resulting from adverse weather conditions, riot, war, strikes or other events outside its control. • loss, damage or inconvenience caused or suffered by the customer in the event that the property is destroyed or substantially damaged before the start of the rental period, in which case the owner is obliged, within 10 days of notification to the customer, to repay all amounts already paid in relation to the rental period. The guest is obliged to immediately inform the owner or agent any loss or breakage in the property, household appliances and equipment in order to provide fast to repair or replace. We work to make your stay enjoyable and make you feel at ease, as if you were in a hotel of high category. Why we do not apply any kind of supervision on electricity consumption but we feel anyway discourage negligent operation. 17. It is not allowed to party, listen to loud music at night, screaming and making noise, take drugs and get drunk. In practice, it is forbidden to take a harassing behavior against the neighborhood. Who violates this rule is assuming its responsibilities and if there is the intervention of the police urged the neighborhood will immediately terminate the contract with the suspension of the availability of the place and no refund, if necessary with the usilio of perhaps of 'order. In case of a violation of these rules and the police intervene and issue an administrative penalty us there accolliamo no burden and lapenale will be your responsibility. We assume no civil or criminal liability arising from your inappropriate behavior inside the apartment. - With just 14 days prior to the day of arrival 0% of the booking price. 19. Both sides agree to the terms of this contract 1-19 and the details of the "booking form". Hello I am Gaston, I love the art and traveling and I can assure you that Berlin is unique. Berlin is a metropolis fantastic, young, vital, suitable for all people. You are immediately at ease as if it were your town ever. View more about Gaston B.B. I stayed here for a month. The apartment is nicely furnished, and super clean. The building is very quiet. The neighbourhood is bustling and it was great to have close access to Kreuzberg and Neukölln. And, being Berlin, it was easy to get anywhere by subway. Thanks, Gaston. We stayed 26 nights with my eleven year old daughter. Safety is the most important issue when you travel with a child. I can say that we didn’t have any concern about safety. Neighbours were also very nice and helpfull. It is also close to U8 metro station Boddinnstraße stop. There are some cheap markets nearby selling fresh vegetables and fruits. Additionaly apartment is convenient and has got every equipment that you will need in your stay. Apartment: simple, very clean, with good light, space and basic amenities. Location is very convenient: blocks from 2 subway stops, many stores, restaurants and grocery store close by. Busy neighborhood felt very safe. Original Schiller Burger and Bakery are in the next block; both are famous for their quality. No street noise, apartment faces an inner courtyard. We kept windows open, so we heard folks in courtyard. With windows closed, it was very quiet. We heard no sounds from apartment neighbors. I will rent this apartment again, the next time I am in Berlin. 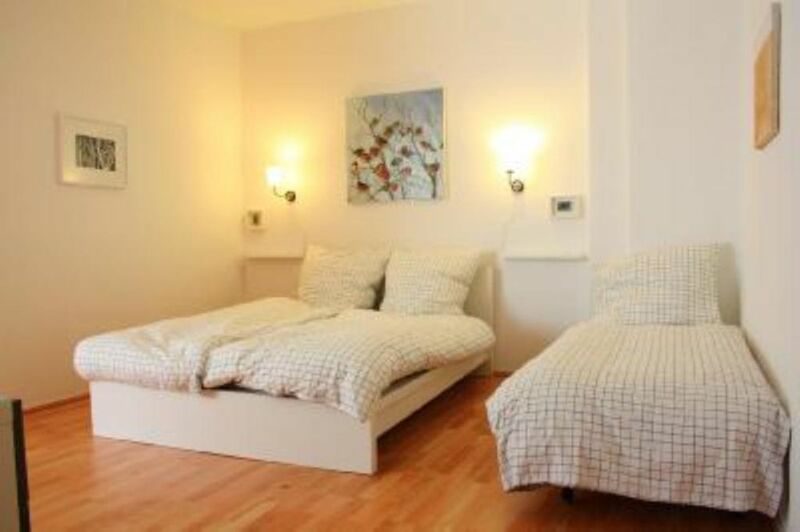 This is a wonderful, clean and quiet apartment in a great location from which to explore Berlin. We enjoyed the city centre and suburbs as well as strolling through Neukölln and particularly to the Tempelhofer Feld which is a disused airport, and now a fantastic public, open space. Parking wasn't an issue for us outside the apartment on the road but perhaps we were luck as it could be quite busy at times. Thank you Gaston for making this apartment available! A pleasant, clean and quiet flat. Very convenient for restaurants and shops. Neukölln is a quirky place. We enjoyed our stay and hope to return this year. "The studio is capacious very well equipped, very clean studio and building, easily accessible by metro and bus, surroundings has many good shops and open till late, but still quiet and safe. A nice choice and with very reasonable price. Owner is very nice and helpful and gives the full data u need." The underground line U8 Blue color (Boddinstrasse stop station) is located 350m. 3 bus lines are within 100 meters from the apartment. Easily accessible from Tegel Airport and Schönefeld Airport. The price includes bed linen, bath towels, final cleaning and utilities included. On request, free wifi internet!! For stays longer than a minimum booking is subject to a tariff cheaper. A few steps away is the park ThempelHof Park recently obtained from the former airport and during the spring will host 'the largest gardening shows in Europe. Near the apartment there are many shops: 5 supermarkets (Kaiser is open from Monday to Friday until midnight! ), numerous bars, several Internet cafes (open from 6 am until midnight), 2 pharmacies, a post office, banks, a church, 2 pools, 3 bakeries, 2 cinemas, 1 outdoor ice rink , a sports field and the new Tempelhof Park (the former airport Tempelhof) already open to the public and will be inaugurated in 2012 and delivered to the city hosting the largest gardening feria in europe, etc.. The apartment is in a very lively intersection of Weisestrasse just to name a few Froschkoenig is the bar where there are events almost every night of music, theater, dance or cinema or other place ... in Sowiso Herrfurthplatz front of the church and restaurant is Café Selig. On the other side of the intersection is the bar / Infoladen Kneipe Kneipe Lunte and later the Lange Nacht. In summer, the park Hasenheide is the outdoor cinema, outdoor pool and the sports ground where in winter you can ice skate, ski skating over a pool and a meeting place for skaters. Turkish market: a Maybachufer (the channel is the pier from which boat trips for a different point of view of the city.